Charlotte, N.C. (June 20, 2014) – Father Matt Malone, S.J., editor in chief of America is pleased to announce that the Jesuit-sponsored journal has garnered a record-breaking 27 awards for journalistic excellence from the Catholic Press Association, the most awards won by America in a single year in its 105-year history. The winners were announced this evening at a dinner to mark the conclusion of the 2014 Catholic Media Conference, hosted by the C.P.A. this year in Charlotte, N.C. The annual event gathers the top Catholic journalists from across the country and Canada to acknowledge excellence in Catholic reporting and to share best practices with its members. Among its 2014 accolades, America was honored for its groundbreaking interview with Pope Francis, conducted by Fr. Antonio Spadaro S.J., and published in September 2013. America was also honored for its coverage of immigration, the U.S. Supreme Court, and the Far East. The magazine’s “Books and Culture” section won first place in its category, as did “(Un)Conventional Wisdom,” America’s politics blog by Robert David Sullivan. “We are delighted to receive this strong affirmation from our colleagues in the Catholic media,” said Father Malone. “This historic night marks the start of the most dynamic expansion of our domestic and international coverage in 30 years,” he noted. The 2014 honors add to the more than 100 awards for excellence in Catholic journalism that America has been awarded by the CPA in recent years. The Catholic Press Association is an association of newspaper and media specialists specialized on reporting on the Roman Catholic Church. Founded in 1911, it has over 600 member organizations and reaches over 26 million people. 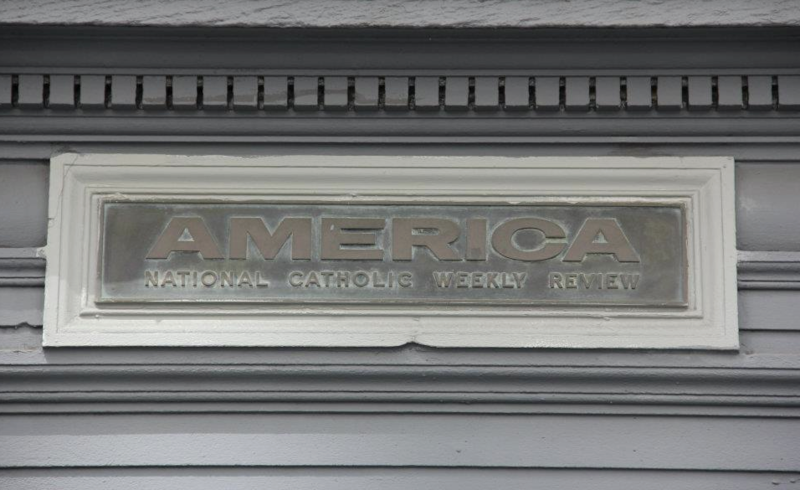 America is the leading national Catholic weekly magazine, a smart Catholic take on religion, politics and culture. Founded in 1909 by the Jesuit order and directed today by Jesuits and lay colleagues, America is a resource for spiritual renewal and social analysis guided by the spirit of charity. Best Special Issue: Pope Francis, September 30, 2013. What a "get," as they say. Props for landing the interview, but further, for asking intelligent questions and letting it roll. It's not often that an interview of the magnitude receives such sprawling treatment, and clearly this one deserved it. Best Interview: Pope Francis, September 30, 2013. It's the new Pope. It's a fireside chat. It's excellent. Best Coverage of Papal Transition (Pope Francis' election and the transition process): His Way of Proceeding, James Martin, April 29, 2913. Provides and in-depth perspective on what it means to have the first Jesuit Pope, in terms of traditions, spirituality and leadership. Best Coverage of Immigration: Welcome, Stranger, The Editors, April 8, 2013. Beautiful scriptural based approach to looking at immigration through the concept of the biblical "stranger." Best Coverage of Marriage: Final Appeals, Ellen K. Boegel, November 25, 2013. The language, tone and style were appropriate to help explain a highly complex situation focusing on how laws and court decisions have compiled to the current views of marriage. Best Review: The Hunted and the Haunted (‘Dark Zero Thirty’), John Anderson, February 11, 2013. Excellent study of the hunt from the personal and political side of the drive to "get that guy." We got him, but author details the cost. And not in dollars. Best Review Section: Books & Culture, April 22, 2013. Well chosen and well edited items. An engaging, interesting collection that will draw readers to items that they may not particularly be interested in, only to discover that they learned a lot. That's a successful section in anyone's book. Best In-Depth Writing: Living the China Dream, John Frankenstein, October 14, 2013. Wonderfully in-depth piece over a very real but inaccessible topic: China. From the allusion in the title, the author frames the issue in a way that allows followers of the American Dream to grasp the struggles of the Chinese Dream. Best Analysis Writing: Road to Recovery, Kevin Clarke, January 21, 2013. What makes this piece stand out is how it follows the money trail as the piece explains the logistics of trying to provide humanitarian aid in a clear and salient way. Best Blog: (Un)Conventional Wisdom, Robert David Sullivan. Judging online blogs can be very difficult both because they are relatively young so we haven't built up expectations as to what to find, and because they are serving an interesting purpose - that of building a dialogue, a conversation so to speak, between the publication and those who read the blogs. (Un)conventional Wisdom has become one of the sites to bookmark and keep an eye on. Just as in the unconventional title, this is a blog that can't be pigeonholed. Subjects are spread over the spectrum, offering observations and speculation that add to the public discourse. What more could be asked of a blog? Best Coverage of the Papal Transition (from resignation to papal conclave): A Historic Departure, Drew Christiansen, James Martin, Vincent J. Miller, Sidney Callahan. Eloquently written perspectives from multiple voices. Best Coverage of Immigration: Rafael’s Story, Lisa Marie Belz, November 18, 2013. The plight of religious people presented through one man's amazing story makes this piece stand out. Best In-Depth Writing: Facing Up to Torture, Raymond A. Schroth, November 11, 2013. The clear and concise language and tone of this piece furthers its message about torture in a well organized probe into the issues of enhanced interrogation. Best Magazine Web Site: www@americamagazine.org. Content is the strong suit of this diverse and in-depth publication. Best Essay: Everything I Can Do, Joey & Matt Kane, July 15, 2013. A fresh voice without pity or aggrandizement; clear, direct, straightforward, compelling. An arresting read. Best Coverage of Marriage: The Ties That Bind, The Editors, April 29, 2013. This article took the most unique approach to the topic of marriage, looking into the age of marrying couples and the legal incentives to do so. A fresh analysis that gives the reader a new way to look at the situation. Best Feature Article: Job Insecurity, Kevin Clarke, February 18, 2013. Well-written piece with good focus on social issues. Best online/multi-media Presentation of visuals: Community Healing and Reconciliation in Rwanda, Kerry Weber. Evocative and completely arresting imagery that captures the aftermath of Rwanda's genocide. Best Poetry: Citrus Paradisi for Anna, Chelsea Wagennar. Very original, very creative. Best Essay: The Root of Evil, William T. Cavanaugh, July 29, 2013. Intelligent writing about an important topic. Best Regular Column: Mark Rossmann, May 13; Angela O’Donnell, May 20; Raymond Schroth, June 3. Michael Rossman makes one want to walk a mile in his Shoes. An elegant and entertaining thought and piece of writing combination. Kind of like walking and praying. "Opinion," Bill McGarvey, March 11, May 6, July 1. Christians and music makes for lively and informative reading. Best Coverage of Religious Liberty: A Protected Rite?, Helen Costigane, August 12, 2013. The importance and need for the silence of the confessional is illustrated through history. Best Coverage of Immigration:An Uphill Battle, Robert VerEecke, February 25, 2013. The pastor's insight highlights some of the nuisances of the immigration issue in a way not shown in other submissions. Best Review: Messiah Complex (Bk. Rev. ‘Zealot’), Donald Senior, December 23, 2013. Jesus. Carpenter's son. Rebel. God. Everyone gets a chance to label Him or him. Reviewer disagrees with author. Not unusual. But the arguments and writing make his views as compelling as the author's. Best In-Depth Writing: Can This City Be Saved?, Kevin Clarke, November 4, 2013. This piece provides an inside perspective on a city many of us glance at from the outside. Merging economic research with on the street investigation with ministries, this piece offers a cross-section of a city on the verge. General Excellence: Issues Dated: October 21, October 28, November 4. This magazine covers a diverse range of topics and uses good storytelling to allow readers to identify with people of all backgrounds.